One of the axioms of global geopolitics is that a country can project power only as far as its economic might allows. There is good reason why the United States, by far the world’s largest economy, has been the dominant force in all things political and military for the past 60 years. And we can see China now rising to superpower status on the back of its spectacular economic ascent. Vladimir Putin should take note. As Russia’s president attempts to reassert his nation’s clout in Europe, he is doing so on an ever shakier economic foundation. The question for Putin going forward is whether his stumbling economy can support his geopolitical ambitions. The answer is anything but clear. Russia’s economy was struggling even before Putin’s adventurous foray into Ukraine. The country had been one of the high-fliers of the developing world, so much so that Goldman Sachs included Russia in its BRICs — the emerging economies that would shape the economic future — along with Brazil, India and China. But a feeble investment climate, endemic corruption and excessive dependence on natural resource exports eventually laid Russia low. Growth last year sunk to only 1.3%, down from the 7% to 8% rates experienced a decade ago. Since Putin’s intervention in Ukraine, Russia’s economic situation has worsened severely. GDP inched upwards only 0.7% in the third quarter from a year earlier, and the International Monetary Fund is forecasting mere 0.2% growth for all of 2014. Sanctions imposed by the U.S. and European Union in the wake of Putin’s intervention in Ukraine have blocked some major Russian banks and companies from accessing financing in the West, starving them of much-needed foreign capital. As a result, the value of the Russian currency, the ruble, has deteriorated by 30% against the dollar so far this year, routinely hitting new record lows along the way. Meanwhile, Putin’s countermeasures have made matters worse. His decision to ban the import of some foodstuffs from the West has caused prices for fresh produce and other necessities to rise. Combined with the weakening ruble, that’s pushing up inflation, which bites into the pocketbook of the average Russian family. Moscow’s economy minister recently said that he expects inflation to exceed 9% by early 2015. The nasty mixture of a depreciating currency and escalating prices have forced the central bank to hike interest rates, which will act as a further drag on growth. Putin so far hasn’t flinched. Instead, he has been scrambling to evade Western sanctions and find new sources of exports and investment in Asia. On the sidelines of the Asia-Pacific Economic Cooperation summit, held in Beijing this month, Russia agreed to a deal to supply even more natural gas to China, on top of a $400 billion pact inked earlier this year. That “pivot” to Asia will take time to bear fruit, however. Right now, none of the negative factors damaging Russia’s economic prospects look likely to turn positive any time soon. “We expect the stagnation trend to continue and potentially accelerate next year, exacerbated by lower oil prices, tighter monetary policy and continued uncertainty on the geopolitical front,” noted Barclays economist Eldar Vakhitov in a recent report. But economic woes haven’t yet translated into political problems. The Russian public is patriotically rallying around Putin’s aggressive foreign policy and setting aside concerns about the economic fallout. In the latest pollconducted by the Levada Center, a Moscow-based independent research organization, an amazing 60% of the respondents said they believed that Russia was heading in the right direction, up significantly from 40% a year earlier. Putin’s approval rating stands at an even more astronomical 88%. What the future may hold is another issue. 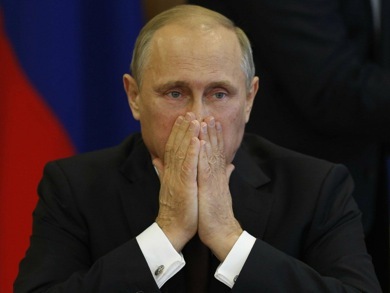 A good part of Putin’s political success has been based on his record of improving people’s welfare, but with no relief in sight for Russia’s economic troubles, it may only be a matter a time before the general populace begins to feel the pinch more sharply. Nor can Putin ignore his economy’s need for foreign investment and technology to upgrade industry and create jobs. He may eventually find himself facing a critical choice — maintaining his foreign policy goals or softening his stance towards the West out of economic necessity. Recall that the Soviet Union collapsed, after all, because its economy could not sustain its international policies. Putin has to watch that history doesn’t repeat itself.